I had a great day yesterday. I left my writing to the ghost at my computer or my cats, whichever one wanted to take residency while I was gone, and played hooky. It was a little hooky combined with work. I visited a couple of my favorite places. You will be able to find the links on my website http://www. julieseedorf.com. My first stop was the Czech Inn Bed & Breakfast in Hayward, Minnesota. http://www.czechinnandretreat.com. My husband and I stopped and visited with friends and had some deliciousKolaches, which are a pastry that holds a dollop of fruit rimmed by a puffy pillow of dough. The Czech Inn sits in the midst of the beautiful farmland of southern Minnesota and is a warm and welcoming place. It was hard to leave such beautiful surroundings. 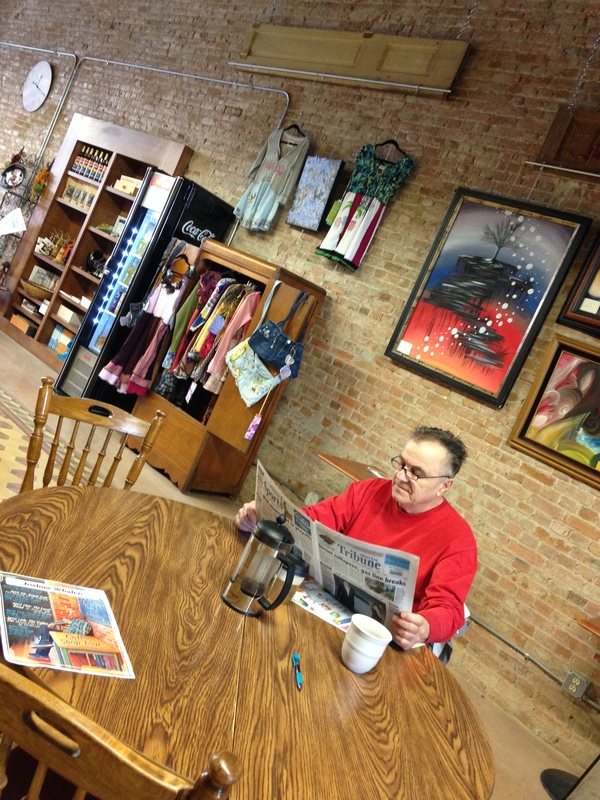 Our next stop was Prairie Wind Coffee in Albert Lea, Minnesota, http://www.prairiewindcoffee.com . Not only do they have awesome coffee drinks and sandwiches, the atmosphere has the perfect coffee house feel. Its warm brick walls are adorned with reused doors that display various types of art my local artists. “Granny Hooks A Crook” and “Granny Skewers A Scoundrel” can also be found there. That is the part of the hooky combined with work, as I was delivering my new book along with setting up dates for some meet and greets for me in the future. Watch for the dates. The only problem I have with Prairie Wind is that I could stay there all day and daydream or write or talk. I seem to always chatter away. Also the owners, Patrick and Chole Hanson, brother and sister, and mom Lisa are very welcoming and always fun to chat with. Occasionally you might find Al Batt, author of “A Life Gone To The Birds” and world wide columnist chatting and having coffee. Lisa Hanson, Owner of Prairie Wind and Me. I would have also like to journey to Champagne, Illinois and Latte Da or Boneyard Coffee & Tea to see what they are up to. Granny and my books should be arriving there today to take residency until someone takes pity on Granny and buys her books. Apparently there is a big arts and craft festival there this weekend and you know how I like arts and crafts. Alas it was time to get back to work and I had to journey back to my little office in stead of on to Champagne, Illinois, to see what my cats Borris and Natasha and possibly the ghost that occasionally puts words onto my computer while I am gone has done. I suspect Nathasha and Borris are behind the ghost but they won’t admit to anything. If you live in Southern Minnesota or even if you don’t, the Czech Inn Bed & Breakfast is a beautiful place to stay and Prairie Wind Coffee is a great place to unwind. Links are here but they will also be posted in my favorite places on my website later on. And of course, if you live in the Champagne, Illinois area or are passing thorough, make sure to visit Latte” Da and Boneyard Tea and Coffee, http://www.latteda.com, and pick up some goodies. Enjoy your day, enjoy your moments and take time out for a day of hooky once in awhile. Tags: Albert Lea Tribune, Author, Boneyard Tea and Coffee, Coffee, Czech Inn Bed and Breakfast, Fuchsia, Granny Hooks A Crook, Granny Skewers A Scoundrel, Julie Seedorf, Latte Da, Minnesota, Prairie Wind, Something About Nothing, Whatchamacallit? Thingamajig? 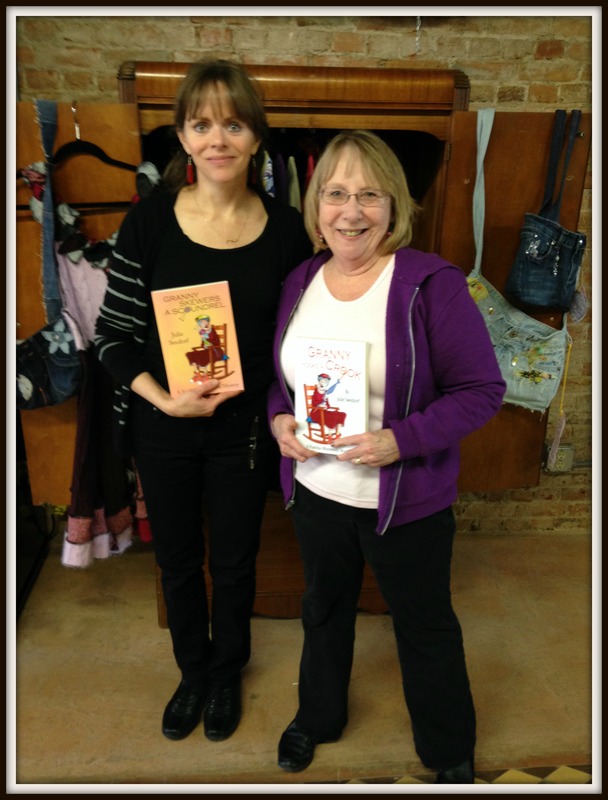 Previous Granny from Fuchsia, Minnesota Visited This Blog Again! She is Weird!